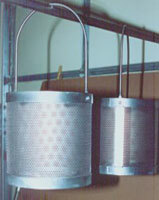 MBA Manufacturing & Supply Co.
MBA is dedicated to provide high-quality anode baskets. 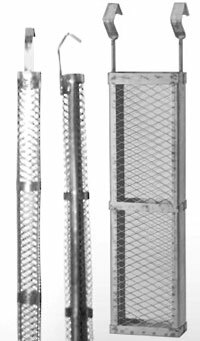 We have a large variety of standard anode baskets, and we provide custom designed baskets. Regular Expanded - Metal sheet expanded to form a regular diamond pattern. Diamond shaped openings are 1/2" X 1-1/4". Open area 72%. Material thickness available: 0.028", 0.040", 0.063". Micro Expanded - Metal sheet expanded to form regular diamond pattern. Diamond shaped openings are 3/16" X 1/2". Open area 62%. Material thickness available: 0.028", 0.040", 0.063". Perforated - Metal sheet perforated to form a pattern of holes on staggered centerlines. Perforated hole size 1/2" diameter on 11/16" staggered centers. Open area 55%. Material thickness available: 0.028", 0.040", 0.063". Alternatively perforated poly pro panels can be supplied. MBA Mfg. 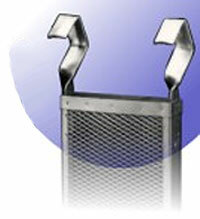 offers a full line of rectangular and cylindrical Anode Baskets. Rectangular baskets are in standard sizes: 2.5" X 6" and 3" X 12". Baskets with different cross-sectional dimensions are also available. 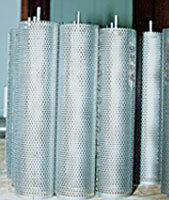 Cylindrical Anode Baskets are available in the standard sizes of 2 1/2" Diameter X Length and 3" Diameter X Length. Baskets with different cross-sectional dimensions are also available. Other, non-standard sizes and custom built baskets are also available. All baskets are equipped with double knife-edge 1/8" X 1" X 4" hooks unless specified differently. 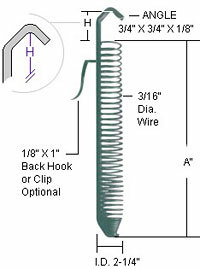 Anode hooks with a cross-sectional area of 1/8" X 1" are rated as hooks capable of carrying 25 Amps/hook. If amperage requirements are different, hooks can be supplied which are designed to carry different amperage loads. Please refer to the table below. For higher amperage load, up to 300 amps/hook, Titanium clad copper hooks can be supplied. Note: Length "H" is typically 3-6"
MBA Manufacturing provides a large selection of custom designed and special baskets, all designed to meet different plating applications.